I have been to The Jetty Oxford before, but on an overcrowded Sunday morning. The food was good enough for me to return but I was cautious as the service last time was sluggish. Dinner was a different story! The food was delicious and the service was great! To start we shared the Crumbed Jumbo Green Olives, Goats Cheese & Tomato Relish $9.50 and the Sourdough Loaf $9.50. I wish there were more olives – we were fighting over the last few! The flavours were perfect and the coating was so tasty! I wasn’t too hungry and the mains were very wintery and heavy. 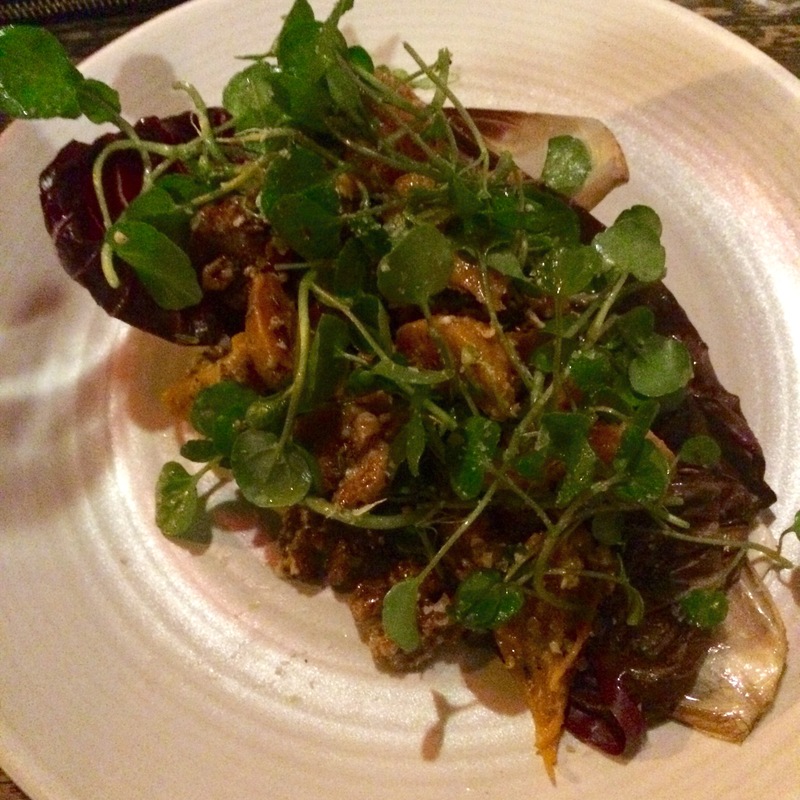 I opted for the Warm Beetroot & Radicchio Salad with Smoked Labneh and Walnuts $17.00 which was the perfect size although probably too much radicchio it was a bit over powering. The rest of my table ordered from the ‘Mid & Main Plates.’ It was certainly a tough choice but we ended up with a good spread. A dish which I was eyeing off if I had the hunger was the Milly Hill Slow Roasted Lamb with soft polenta, streaky bacon, honey carrots & smoked feta $36.00. This was the dish of the evening the lamb was cooked well and all of the accompaniments matched it perfectly. 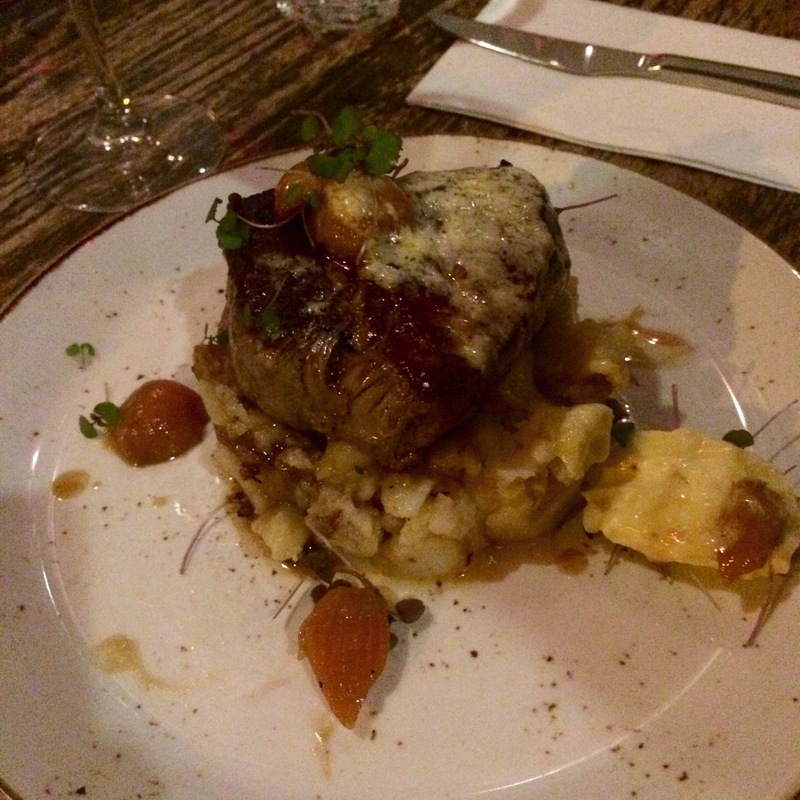 Another hearty dish we had was the Angus Beef Fillet accompanied by Parisian potatoes, smoked baby beets and horseradish cream $39.00. Unfortunately for the price we paid for the meal it was not reflected in the size, the dish was small and unsatisfying. 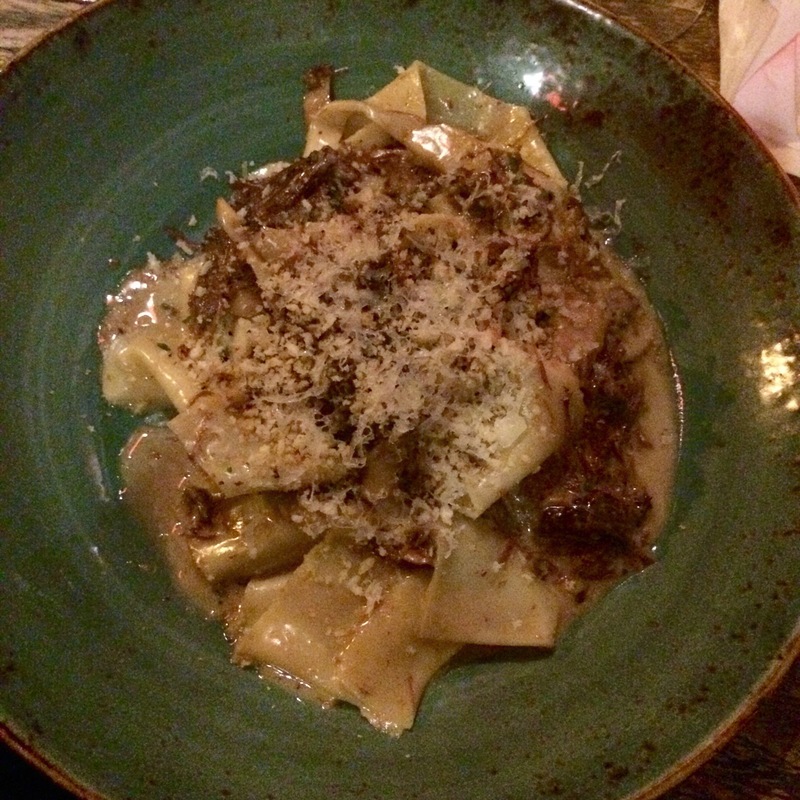 Lastly, the Beef Cheek & Mushroom Ragout with pappardelle, porcini cream & gremolata $32.00. 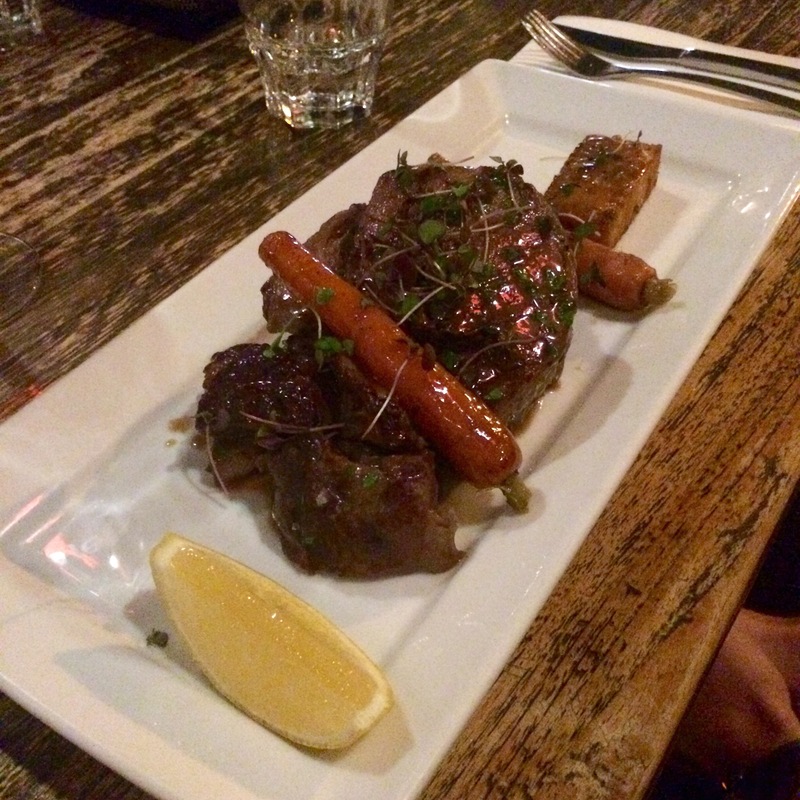 The beef cheek was cooked beautifully it was tender and succulent. We shared a bottle of the Tatou Pinot Noir which was the perfect choice for the foods and the cold winters evening. The cocktail menu looks inviting and interesting. As the name suggests “The Jetty” is located at the end of Oxford Street by the Bulimba City Cat Terminal. We sat outside (hence the poor quality of the photos) but the heaters kept us warm and we were then not subject to other loud patrons which often happens. The atmosphere was very pleasant. Even though we were sitting outside out of the way the staff were very attentive and we were never forgotten. For a busy Saturday night our food was served relatively quickly. Make sure you make a book on the weekends as they book out fast.